Bing's market share has risen, and the latest update to its mobile app brings it closer to being an all-in-one resource. Bing is witnessing a surge in market share and cutting-edge mobile app functionality that is making Microsoft's answer to Google not only a contender in the search engine wars, but also an app-killing mobile mammoth. Bing's current market share is at its highest since the search engine was released in June 2009. According to comScore's November 2010 report, Bing holds 11.8 percent of the market, up from 11.6 percent in October. While those numbers aren't even grazing the shadow of Google's 66.2 percent market share, Bing, for many, is becoming an alternative to Google. Add to its rise in market share the updates Bing brought to version 2.0 of its mobile app for Android and iOS devices. With every update, the Bing app is getting closer to becoming an all-in-one resource, and its new features, to me, dwarf and embarrass Google's comparatively lame smartphone app. Search for a restaurant and Bing will sort results by price range, cuisine, atmosphere, or location. Bing 2.0 also integrates OpenTable and GrubHub into the results, so if you need a last-minute reservation or want to order take-out online, you can do it right from Bing. This union essentially renders the OpenTable and GrubHub apps redundant. 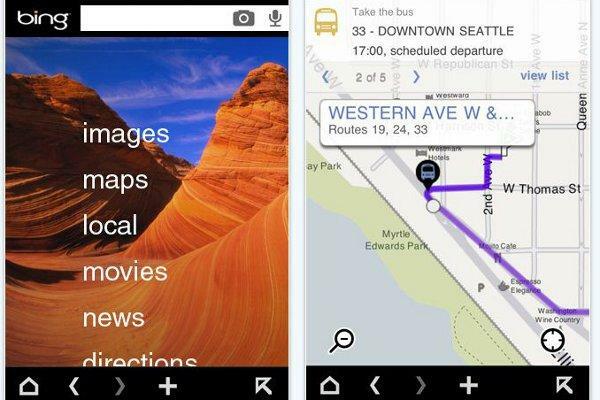 Using your smartphone's GPS, Bing finds nearby movies by name or theater. Fandango is the first search result when you scroll to the bottom of Bing's list, and though these two apps haven't yet joined forces, I see that as a no-duh future addition. Users can now check in to Facebook, Foursquare, and Windows Live Messenger without leaving the Bing app. You can also Facebook "like" your search results. The ability to check-in through Bing will not replace the other apps, which provide more than check-in functionality, but if checking in is all you want to do, Bing is a simple alternative. Once you've linked Bing to your Facebook account, you can create Facebook Events right from your phone. Invite a group to dinner and a movie or escape the office for post-work booziness. Include notes, geographical locations, and share your night out on your Facebook wall. Bing's answer to Google Streetview. This new mapping feature presents a multistreet level panorama of a location so you can take a virtual stroll around a location and scope out its landmarks. Slide the street level imagery sideways, and the view of the sidewalk is seamlessly constructed, including an overlay of business listings, street names and store fronts. If you set a location-based note on your phone -- i.e. swing by the grocery store -- when you're near that location, Bing will send you a reminder notification, including your note. This is great for people who have a bunch of stop-offs on a trip home and can't seem to keep them straight. This is by far my favorite Bing add-on, and combined with Bing's slick directions search, it's replacing my use of the preinstalled Google Maps iOS app. Bing now presents standard transit routes for 11 cities, including Boston (my city! ), Chicago, Los Angeles, Minneapolis, New Jersey, New York, Philadelphia, San Francisco, Seattle, Washington DC, and Vancouver BC. The best part about this addition is that when you're following Bing's directions, you have a choice of route options. The desktop version of Google Maps has this feature, but when you're using the Maps app on the iPhone, you're only given one option (which may instruct you to walk off a cliff) and you cannot re-route. On an aesthetic level, Bing's new Zune-like menu interface is also a treat for the eye, whereas Google's app still looks like it was constructed by a third grader. Barring a server meltdown or an Enron-like accounting scandal, Google will never be bested by Bing. But Bing's steady Web search improvements, all-in-one mobile app updates, and slow rise in search engine market share stand as evidence that Microsoft's engine is chugging along with great innovations.